Freshly baked with sugar, sweetness, and a little bit of love. 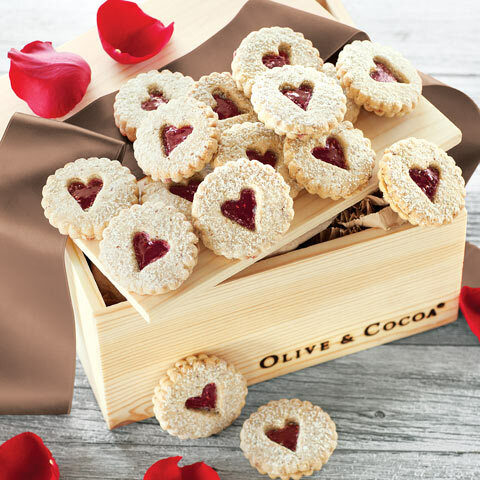 A homespun delight, our collection of beautiful raspberry filled Heart Windowpane Cookies dusted with a sprinkling of fine sugar is a truly delicious treat. 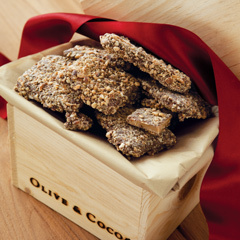 Two dozen buttery and crispy cookies come gift wrapped in a hand crafted wood crate with ribbon. Gluten free. Heart Windowpane Cookies is rated 4.6 out of 5 by 41. Rated 5 out of 5 by rhonda1sue from Heart Windowpane Cookies The recipients of my gift each called to say how much they loved their Valentine gift! They loved the cookies and the great packaging! Rated 3 out of 5 by Kitty426 from Nice thank you gift I ordered this for a nurse in a well renowned hospital who retired and always treated me very well. I was disappointed that I was never notified of the delivery to her. She lives in another state. I had to call you to be sure it was delivered. Rated 5 out of 5 by Bordie from Beautiful presentation I chose this Valentine gift for a special friend of 63 yrs. suffering with a chronic illness. She was amazed to open the crafted wood crate revealing the Heart Windowpane Cookies. So beautifully paired and appreciated. Ordering by phone for long distance delivery was simple. Rated 3 out of 5 by Bh2019 from Not up to standards Have had excellent luck with all of your previous products, but these cookies were underwhelming for their recipients. They reported the cookies having not much taste and just being "OK." I was disappointed, as I had planned these to go to both my husband and his staff, and my son and his co-workers and neither was terribly excited about the goodies because they weren't nearly as tasty as things they'd received in the past. Also, the package sent to my husband's (very clearly detailed) work address was mis-delivered halfway across the college campus where he works and he has to track it down (not what one should need to do, with a Valentine's gift!) I know O & Co can do better! Rated 5 out of 5 by Janie49 from Delicious Cookies with a Treasure Box I bought cookies for my 89 year old Aunt last year and she loved the cookies and the packaging of the box! So, I bought her more cookies this year and I am now her official favorite niece!! She loves sharing with her friends. They make her feel very Special !! Rated 5 out of 5 by TonyMiami from Great cookies Everyone who got the cookies loved them. We told them to eat one a day. Rated 5 out of 5 by KarenS from My Mom Loved the Cookies I shipped these cookies to my mom for Valentine's Day, and she loved them. She said they were light and buttery and practically melted in her mouth. 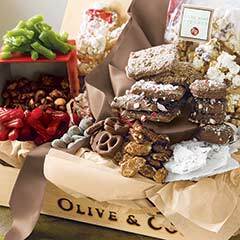 I applied a store credit to the order that Olive and Cocoa had given me for a previous order that didn't go quite right. They were very generous in fixing the situation--great customer service! Rated 5 out of 5 by Mickiw from Absolutely made her day! This was a gift for a relative recuperating from surgery. She was so happy she had tears in her eyes. You made her day with cookie love!